During the thirties, Mum and I used to visit my grandfather James Ward nearly every week in Bethnal Green, travelling by tram and bus from our home in Leyton. He lived at 5 Minto Place which was part of a terrace of houses whose front door opened straight onto the pavement. It was a rented house and the front upstairs bedroom was sub-let to Mr & Mrs Shave whom we never met. Steep linoleum-clad stairs led directly up to grandfather’s tiny workroom at the back of the house. His trade was making hand-sewn ballet shoes, made from lovely soft leather, black, red and white, which when finished would dangle streamer-like on hooks from their long laces around the wall. He also made light-soled shoes and I can see him now, using hob and last, cutting, fixing the sole and hammering the tacks into place. My grandfather sewed ballet shoes with waxed thread using two needles simultaneously which were curved at the ends, one held in each hand. He always wore a well-worn coarse apron, deeply marked with grease and dirt, and his hands bore the evidence of years of hard work. A fire burned in the grate in his work room in winter and it was stifling hot in summer, even when the sash window overlooking the yard and the adjoining grimy rooftops was thrown open wide. Frequently, he stopped for a rolled fag of good British Oak tobacco, which was lit by a homemade bullet-shaped lighter with a huge uncontrollable flame that had to be carefully manoeuvred to avoid singeing his moustache. And he supped large mugs of tea, in which he left the spoon whilst he drank. Meanwhile, downstairs in the tiny scullery, Aunt Mary managed all the household duties in a quiet detached fashion. There was a coal-burning copper for clothes washing in one corner, with a deep sink and scrubbed wooden drainer attached, beside a small table and a cooker. Everything was spotlessly clean but very basic. When needed, odd slip mats were placed on the linoleum covered floor. Obviously, times were hard yet my Aunt was a wonderful manager, making the best of what was available. Refreshments with my Aunt were taken in the dark front room. Bread, butter and jam, and quite often soda bread was provided, plus a good solid dripping cake with a handful of dried fruit. The fireplace had an over-mantle with ornaments and framed sepia photographs and, in winter, a coal fire flickered (excellent for making toast) and shone on the china cupboard with its coloured glass and decorated plates. The gas mantle over the fireplace was lit when dusk descended but not before in an effort to keep costs to a minimum. A fire would only be lit in a bedroom if the inhabitant was seriously ill – this was the only exception! The scullery door led out into a small, walled backyard. It contained the lavatory with its scrubbed wooden seat and newspaper, carefully cut and hung on a string. The communal tap of the house was also in the yard alongside the tin bath hung from a nail on the wall. Jim, the terrier dog, had his kennel in the corner beside the mangle with large wooden rollers. My grandfather had a disfiguring lump in his back. Apparently, he broke a bone years earlier while climbing a ladder at home but he scorned doctors and paid no attention to it at the time. In later years however, it gave forth an unpleasant discharge, although he never made any fuss about it. A very tough man, as those of his time and circumstances were, he had to survive and any show of weakness was scorned and belittled. His personal remedy for his ailment was ‘a good dose of liquorice powder,’ a tonic which he also administered to his dog. Aunt Mary dutifully moved into Minto Place to care for my grandfather during his middle to later years. Missionary work in the East End of London was her life’s work and calling. 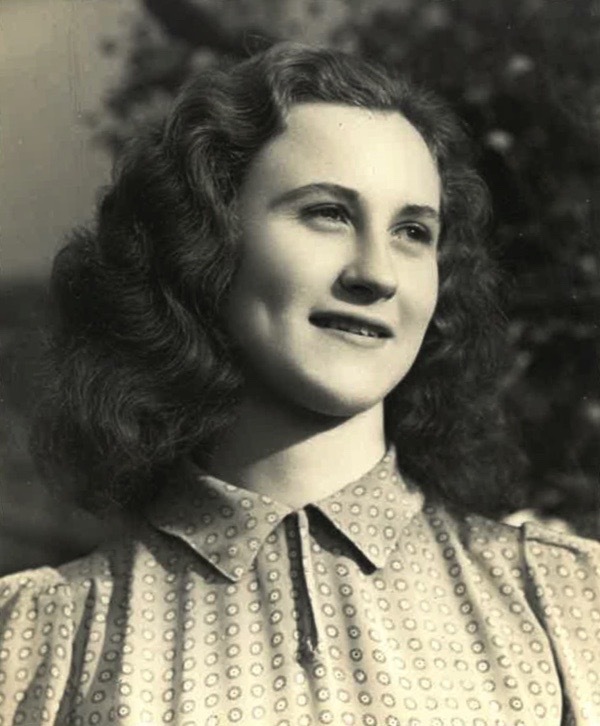 Quite often accommodation went with the job and finally she became a caretaker and companion to a couple at a Jewish Mission close by Bethnal Green station. She always thought of the welfare of others with complete disregard for herself. My grandfather was an Air Raid Warden during the Blitz and ruled Minto Place and its inhabitants with authority. His ‘local’ was the Lord Canrobert, just around the the corner in Canrobert St, to which made his way with clockwork regularity for a pint of beer. Cribbage was played and I seem to remember money being paid in weekly for various Thrift Clubs, a means of ensuring money was available, however little, when needed. Sometimes an unattended pram would be seen outside with a couple of young children in it, whilst the parents were imbibing, but mostly pubs were male-dominated while the women stayed at home. Wolverly St playground and the dark satanic school with its high walls faced Minto Place. Neighbours often gathered at their hearthstone doorways, some sitting on chairs in sociable groups, for this was the place to exchange views or just watch life pass by. A cool breeze could be created by leaving the front and back doors wide open the filter air through the house. If you were lucky enough to scrounge an orange box from the market, add a set of old pram wheels, you were much sought after by companions. Home made scooters, were also popular, as well as hoops, tops and whips. One method of washing was the Bag Wash. Clothes were boiled in vast coppers and taken home, after they had been mangled, to drape over what was available to dry, and irons were permanently kept by the fire to be heated when necessary. This was the hey-day of the Pawn Broker with three brass balls hanging outside the shop. People in need of money urgently to pay off a debt, usually the rent, pledged whatever they thought might bring forward some ready cash – a suit of clothes, a watch perhaps – in the vain hope that they could pay back the Broker to redeem the items at a later date. Most streets had a corner shop where such essentials as firewood at a penny a bundle could be bought. Paraffin and Carbolic Acid for drains were dispensed to your own tin or bottle, and Vinegar was stored in wooden casks – everything was sold loose. There were biscuits displayed in tins from which you made your own choice – pick ‘n’ mix – and broken biscuits were much sought after because they were cheaper. Household soap was sold as a long bar, cut to size as required, and stored for a while to harden in order to last longer. Groups of musicians begged in the streets, frequently ex-service First World War veterans who were quite often limbless or blind and ever hopeful of a penny thrown their way. Unfortunately, most passersby were just as hard up themselves and could not afford to contribute. East End Sunday mornings were never complete without a visit to crowded Petticoat Lane in Aldgate for shopping and meeting friends. The choice of goods and produce was vast, ranging from home made toffee and cough candies to fruit, flowers and vegetables. Herrings were sold straight out of deep barrels and live eels wriggled in trays until they came under the thud of the cleaver to be chopped into small pieces for the waiting customer. They did not come fresher than that! I shall leave the smell that pervaded the air to your imagination. Hawkers sold bottles of medicine which they said would cure all your ailments. I well remember one who had the answer to the elimination of worms, which were quite prevalent in those days – I suppose through lack of general hygiene. He would have the offending worms on display, preserved in glass bottles, to support his claims. One had to be careful of bag-snatchers and pick-pockets in such crowds. Nearby, Club Row was for the sale of livestock – puppies, barely old enough to leave their mothers, chicks to be reared in back yards for much-needed eggs, goldfish to be carried away triumphant in a jam jar. More or less anything could be bought or sold there. Horse-drawn carts and wagons, both commercial and domestic – including the baker and the milkman – were still the main form of transport. While the carters were in pubs and cafes at lunchtime, horses were given their nosebags containing chaff, usually leaving great drifts of the stuff in the road where they had thrown up their heads to eat the reminder of the bag and spilt the contents. Great long stone drinking troughs were located at busy street corners for their consumption. Someone was always on the look out, ready to rush out armed with a bucket and shovel to sweep up the resultant manure for sale to the few who may have had a postage stamp-sized garden. I think the going rate was a penny a bucket. My grandfather’s pride and joy was a very heavy bicycle on which he travelled everywhere, lit by a huge acetylene lamp. He had a black cape and sou’wester for wet days. When we lived in Leyton, Chingford and later Ilford, he regularly visited us on Sundays ‘on the bike’ up until his late seventies. His first encounter with a roundabout on the Woodford Avenue completely flummoxed him and he said he went round it the wrong way. Rene & I always received sixpence pocket money on these welcome visits. When we lived at 20 Flempton Rd, Leyton E10, my dad and grandad rented an allotment nearby. They shared the cost of seed, the work and the produce. Grandad cycled his share back to Bethnal Green in a hessian sack tied around his body. Dad built a nice shed with seats on three sides and hooks to keep the tools. A well was sunk and protected with a creosoted wooden lid. Grandfather died in his mid-eighties after a short illness. Aunt Mary brought us the news – few people had telephones – and I can still remember the shock and emptiness that his death brought me. No more to hear the eagerly-awaited bell ring out on his bike to herald his arrival. No more to hear the latest news of Minto Place and its environs. He was a much-loved hardworking Victorian man, full of character and strength. Minto Place was patched up many times after bomb attacks and was eventually pulled down for redevelopment. Aunt Mary was temporarily rehoused in a flat in the Guinness Buildings, Victoria Park, Bethnal Green, which was a dreadful depressing old building, long overdue for demolition. It was so dark that the light had permanently to be kept switched on. Lines of washing, secured from the balconies, stretched across courtyards until it was dry. Conversations seemed to echo from every level and the smell and feel of poverty was all around. Thankfully, she was transferred to a block of flats know as Peabody Buildings in the Cambridge Heath Rd district of Bethnal Green, where she lived for a while, before finally moving as part of a London County Council scheme to relocate people out of London into the countryside at the edge of the Green Belt at Chigwell Row in Essex. It was retired person’s flat but it was not long before she found part-time work, helping the family with housekeeping. I hope they appreciated her fully and thought themselves fortunate to have her services, as there never was a more conscientious or hardworking person. She lived entirely for other people – Church, family and work were her priorities. Aunt Mary visited us at Babbacombe Gardens, Ilford, once a month, travelling by bus to Gants Hill and changing. When my brother Martin was born in 1953, she took over from my mother at the time of his birth and stayed a couple of weeks to undertake all the household duties to the last detail. Although she never had much money to spend, Aunt Mary had the magic touch with cookery and was always able to turn basic ingredients into an appetising meal. Her needlework was also born out of making something out of nothing. Invariably, second hand material was used and her stitches were so tiny they could hardly be seen. BBC Radio Four was her constant companion, enabling her to keep abreast of current affairs, and reading widely was a great joy. The bible was the source of her knowledge, direction and peace of mind yet she was never sanctimonious or forced her faith upon us. Poetry was of particular interest to her and she would sometimes borrow my books to share and read aloud with her friends. I remember the Welsh poet W.H. Davies being one of her many favourites. Perhaps his early days as a tramp appealed to her? Aunt Mary died aged seventy-six and is buried in Chigwell Row churchyard. Only upon reflection as an adult do I fully realise and appreciate her sterling, selfless qualities and sensitivity which endured unwaiveringly. I feel privileged to have such a dear aunt as my mentor. What a lovely article. Really enjoyed reading it. Thank you so much for this vivid story of plucky caring people. My grandmother was an East Ender who married my New Zealand grandfather after meeting him during WWI. I do wonder if she imagined herself returning home to her lovely London and seeing her old family and friends. She saved enough money to enable her to make a return visit but died before she could. 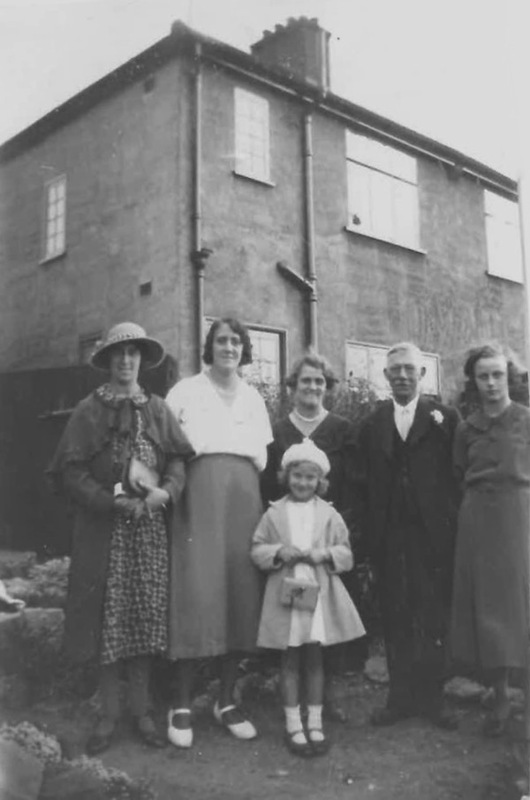 It was lovely meeting Joy and her Aunt and Grandfather through this account and it is so important that the details are retained – the images of what people did, how they worked and their households. Through the changing times these stout people did not change in character. They were strong and caring and through these memories their spirit lives on. Magnificent – feeling very grateful today. I have just finished reading your article and I must tell you I really found it very moving.The times were so tough but the old East- Enders seem to be a very special people. I particularly like the the picture James Ward with his suit sitting on the the beach , good man! What an evocative memoir and so beautifully written. I got quite a tear in my eye at the bit when her Grandfather died. Magnificent is a great word for this, agreed! Thank you Billy Reading for sharing this touching memoir of your Aunt Joyce Ellis and Grandfather James Ward. Through your well written descriptions of the sights, sounds and smells, I am instantly taken to a time gone by that I can only imagine but have read many times was filled with pride, order and ‘make the most of what you had’ and if you would please excuse the pun, both your aunt and your grandfather were filled with good old British back bone and I can well imagine that the little broken bone caused your dear grandfather much discomfort and irritating pain which he kept to himself, as was the order of the times to ‘get on with life and make the best of what you have’. A tougher way of life but one which had the importance of family. My mother was born in 1919 and I adored listening to her when she recalled stories of her young life living in a completely different world to the one we live in today and when she spoke of ‘those days’ there was a beautiful glow emanating from her eyes as she recalled a life which still had remanences of the Victorian era especially her grandmother who still dressed in thick black taffeta and on each visit would bang down her silver topped cane as she demanded ‘her’ seat by the fire’. I imagine her like a character from Dickens, but strict order was the day and that order had a comfort my mother said she missed and that we do not have nor understand today. I sense that order and comfort in your beautiful memoir, how lucky you are to have such lovely memories. 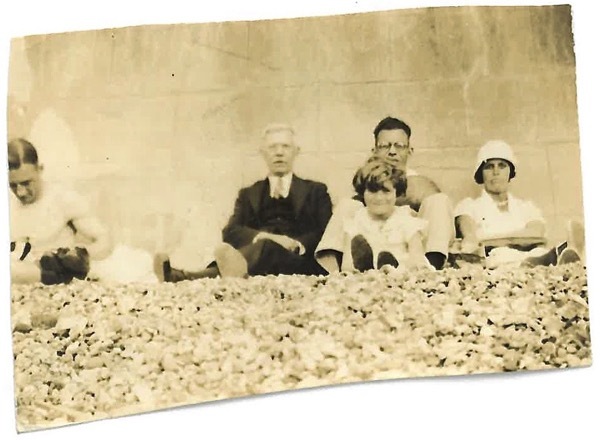 I am struck by the photo of your grandfather wearing his suit to sit on the beach. I live near a lovely beach and have seen photos from the Victorian era of men and women sitting on this same beach in their finery of suits and bussled dresses and I often wonder how they coped as I sit sweltering in T shirt and shorts. A different time and different back bone. how beautifully put. felt i knew these people. wish i had. Magnificent account of times gone by. Thank you. I was interested in the fact that his aunt “was transferred to a block of flats known as Peabody Buildings in the Cambridge Heath Rd district of Bethnal Green.” George Peabody (1798-1869) was an American banker/philanthropist from Peabody, Massachusetts (the city near Salem was later named for him) who settled in London around 1837. United in business with J. P. Morgan, Peabody made a fortune, much of which was devoted to improving the housing of London’s poor. Needless to say, Queen Victoria was delighted with his efforts, even offering a spot in Westminster Abbey for his final repose. Yet he chose to be buried on his native soil. His statue by William Wetmore Story can be found in front of the Royal Exchange in London. Beautifully written and moving, thank you TGA for sharing this on your blog. How sad there is no photo of Mary, who seems to have been such a kindly and salwart individual. I enjoyed reading about her. I’m glad so many others have enjoyed reading this too. Beatifully written. What a beautifully written piece. I felt as though I were there. Joyce Ellis and Billy Reading thank you so much for this beautiful memoir. My father lived at 2 Minto Place in Bethnal Green as a baby and young boy. At age 5 (1915) he was sent to live with an aunt outside of London when his father was killed in action in France and London was bombed. He migrated to Australia in about 1925. This evocative memoir has transported me into his world and provided me with some insights and understandings of who he was and who I am.